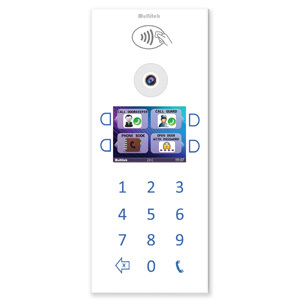 A smart Doorstation & Intercom system that gives the user more options, in a simple user friendly interface. The IP Intercom system linked with the VIP70 Room Monitor to become an all in one intercom system. Each apartment using the VIP70 Room Monitor, at the press of a button can: activate the intercom, view the camera, open the Door, send sms messages between devices and alert building security, manager or concierge. All with a familiar iPad/tablet touch screen style interface. 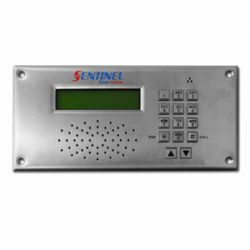 The IP Intercom system is designed to be a flexible and scaleable. Have up to two intercoms at two entry points and multiple VIP70 Room Monitors in installed in each appartment. All with a plug and play simple installation method. The resident can walk around with the VIP70 (WiFi version) Room Monitor and use the device where ever they are in the home. While you are on the couch or in the back yard, at the push of a button you can see who’s at the door and let them in. In the concierge feature, the resident may give an SMS instruction (eg. ‘Please call me a taxi’) by touching an icon on the screen. A handy feature for a retirement village or apartment with a reception attendant. The PoE switch connects and powers all the devices that are connected using the CAT6 cable. 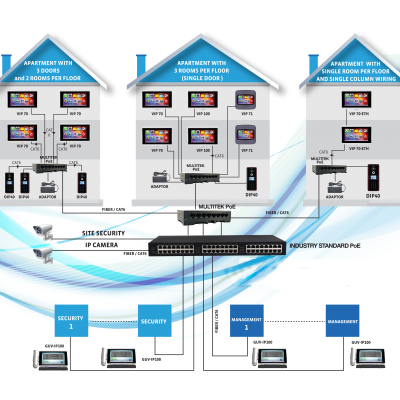 The IP system can be expanded to any number of rooms, as long as the required number of PoE switches are installed. Door Panels, monitors, PoE switches and adapters are mounted to all blocks apartment blocks. If the distance between the blocks of apartments is less than 70 meters, the apartments can be connected with underground CAT6 cabling. The guard points in the site are equipped with the 10″ guard station. If the main entrances of the site have IP cameras they are connected to the IP intercom network so the rooms can monitor the entrance points. Unlimited number of: room monitors, door panels, indoor panels, elevators, door keepers, guards, guard cameras etc. are connected to a PoE switch and are all powered via PoE. The main enterence door is opened by Key-Less entry (entering a password) or using a RFiD proximity card or by the room monitor.